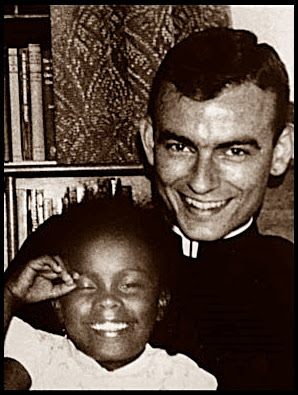 The above image is of Jonathan Myrick Daniels (and unknown girl). I had just recently learned of this brave man's story and was moved to post about it, and it happened exactly 50 years ago today. He was an Episcopal seminarian and on his second march in southern Alabama for Civil Rights. He and other protesters were picketing a week prior and arrested. They were held for a week in a hot, crowded, and primitive jail. When they were released they were provided no transportation back to Selma so they had to walk. The southern Alabama temperature hovered near triple digits and they went to a local store to purchase something refreshing to drink. They were met by a man with a shotgun and gun on his belt and were not allowed to enter because some of the protesters were black. The shooter (I shan't glorify him by mentioning his name) raised the shotgun at Ruby Sales, who was 17 at the time. Jonathan Myrick pushed Ms. Sales out of the way and took the full blast from the gun himself. He died on the spot. The shooter went on to shoot another protester in the back but thankfully he survived, as did Ruby Sales. She went on to study at the same seminary as Myrick, and started a foundation in his name. Stories of courage such as this are what move my soul. And inspire me. And renews my faith in humanity. This...this is what should be in the news about Christians in action. I can only imagine what good this man could have continued to do if not for his life being cut so tragically short. Rest in peace, brave Jonathan.